There are days when it’s easy to forget that the Chicago Cubs are as young as they are. There are other days when it’s impossible to forget. The latter was on display several times throughout their series with the foundering Miami Marlins. The pinnacle was during the rubber match Wednesday night when Junior Lake clobbered a Dan Haren pitch 400-plus feet. It took a while to land. The catch was that when it did, Junior Lake wasn’t even to first. He watched. Then he watched a little more. If Joe Maddon’s philosophy is centered on “Respect 90,” then Lake took the opportunity to respect each and every foot on his way to first. And in one of the less shocking developments of the night, the Marlins took exception –especially when Lake gave a “shhh” gesture as he continued his leisurely stroll around third base. Some words were exchanged, the benches cleared, and then nothing happened beyond some extended jawing between Lake and Marlins pitcher Jose Fernandez. Side note: Is there anything more lame than watching bullpens empty all the way from the outfield? 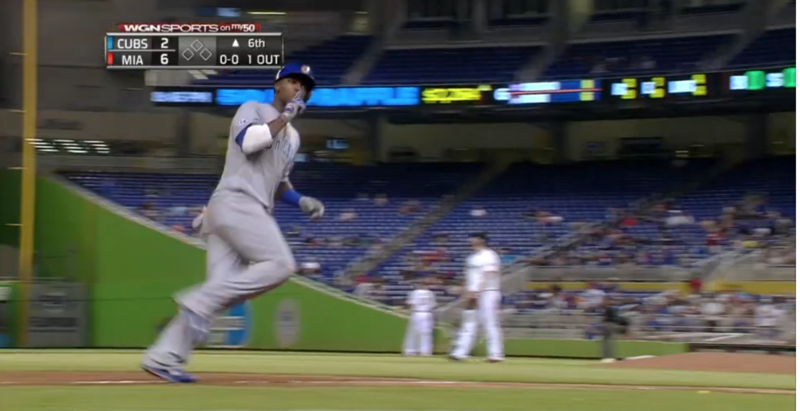 Not to say that only young players showboat on home runs, but Lake made himself look the fool. The Cubs were down 6-0 on Dan Haren, who had mostly been untouchable to that point, Lake has bounced between Triple-A and the majors, and is barely hitting .250. I’m all for players having a little fun, but c’mon. With Jorge Soler headed to the DL with a sprained ankle, Lake presumes to see some increased playing time. If he wants to hit home runs, we’re all for it. But if he thinks 423-foot home runs impress fans in Miami, he hasn’t been watching Giancarlo Stanton too closely. Just run the bases, Junior.